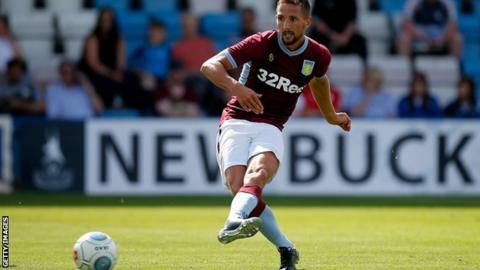 Aston Villa midfielder Conor Hourihane says the squad will use their play-off final disappointment in May to drive them forward this season. Villa were beaten 1-0 by Fulham at Wembley as they missed out on a return to the Premier League. Turbulent times followed off the pitch, with a number of players departing and owner Tony Xia hinting at cutting costs this coming season. "We need to regroup and start showing we can win games," Hourihane said. The 27-year-old scored a hat-trick in a pre-season friendly win against Walsall on Tuesday and indicated morale was still strong among the squad. "There's a lot of lads still here from last year," the Republic of Ireland international told BBC WM. "The disappointment will drive us forward again. "We've got to go for promotion again this season. We're by far the biggest club in the Championship and we'll be giving everything to achieve that."